Since his election in 2016, Duterte has built a reputation as a strongman leader who has instigated a brutal crackdown on drugs traffickers that has allegedly led to thousands of extrajudicial killings and human rights violations. “Malacañang places the blame on human rights organizations for the Duterte administration’s failure to curb the illegal drug problem and accuses them of smearing the country’s reputation,” the Karapatan human rights group said in a statement. “In case [they] haven’t noticed, Duterte did that all by himself, in a path of tyrannical megalomania and unparalleled self-destruction,” they continued. Last week, presidential spokesperson Harry Roque, who himself once was a human rights lawyer, suggested that the reason human rights groups may be so vehemently opposed to Duterte’s crackdown is that they are receiving funding from drug organizations in a bid to destabilize the government. “To continue to do and thrive in the drug business, these drug lords can easily use their drug money to fund destabilization efforts against the government,” he posited. Duterte has repeatedly expressed his contempt for human rights organizations and accused them of hindering his anti-drug war, where he has urged his forces to “spare no one” in their war against drug barons. Last September, he cut the country’s human rights budget to just $20 a month and has suggested that investigators should be fed to crocodiles. Opponents are now increasingly describing Duterte as a tyrannical leader comparable to the military dictator Ferdinand Marcos, amid other fears that he also clamping down on freedom of the press. 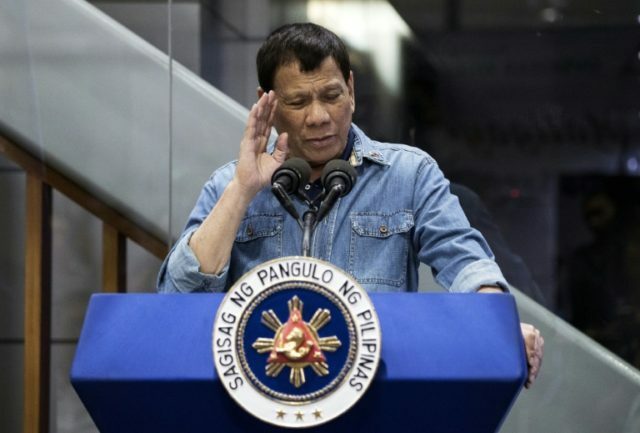 However, a recent survey found that satisfaction with Duterte’s administration is the highest of any Filipino government since the 1980s, with an approval rating of over 70 points, making him one of the most domestically popular leaders in the world.